"My old clothes don't fit like they once did, So they hang like ghosts of the people I've been." The Unutterable (this album) (2000). 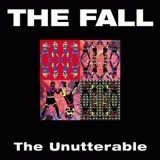 Sorry, no matches on eBay for "Way Round The Fall".